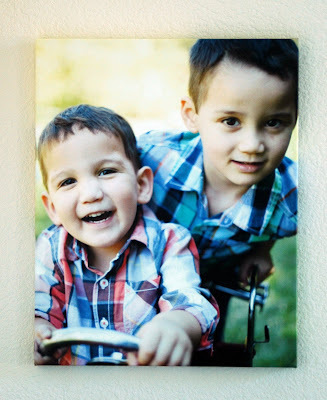 A little while ago, Easy Canvas Prints contacted me to do a review of their canvas prints. I absolutely adore having photos of my kids around the house so I jumped on the opportunity to do this review! I choose a 16x20 print to review. I was given a canvas in return for an HONEST review and an ad on my blog. I received my canvas and was absolutely delighted to see my picture! The quality is superb. I choose the mirror wrap option which looks great on the wall because when you look at it from the side, you can still see color. Because of this, you don't need to frame your canvas. The colors are bright and vivid. I have a few canvases around my house and I love that this one doesn't have any glaze painted on it. It really lets the picture shine through. This photo was taken by my friend Amy at Amy Leigh Photography. I love my Easy Canvas Print and I would recommend them to anyone! I would order from them again. You can also try to win a canvas by liking the Easy Canvas Prints Facebook Page, they have a lot of contests on there. Such a cute portrait of the boys and it looks great on the canvas. They also contacted me but I turned them down as I didn't want to commit to giving them space for 1 year on my blog. beautiful picture of the boys, looks amazing on canvas. I was thrilled with mine as well...although I haven't got my post up yet.